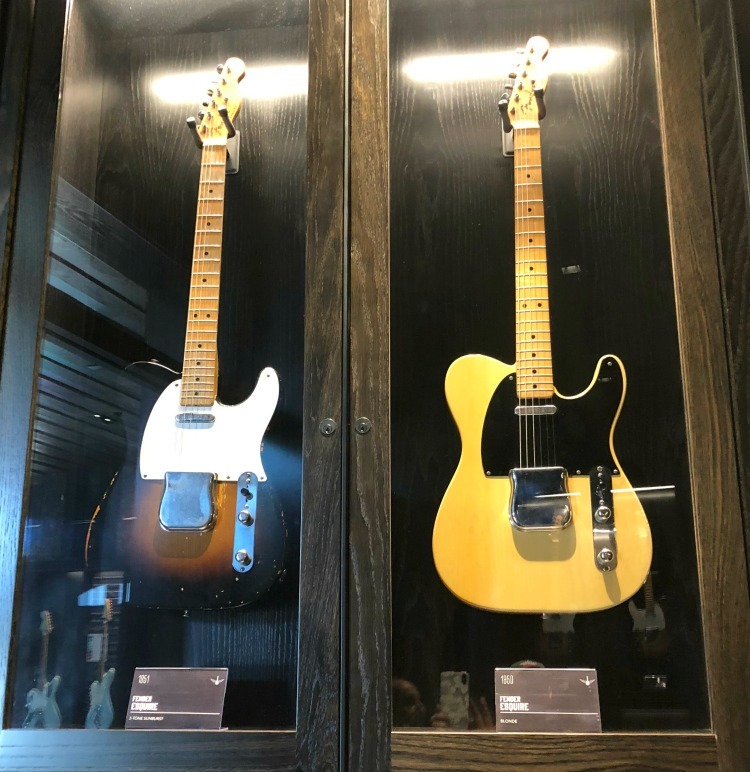 Another part of doing some sightseeing in our own hometown was finally getting a chance to make a visit to the Songbirds Guitar Museum. Songbirds has brought guitar history to Chattanooga. And what a treat!! For any music and guitar lover, or collector, this is a MUST visit. Opening about a year ago, you will see and hear some of the rarest guitars known. Let me first say what an awesome exhibit it is and how fortunate we are to have such a facility located right here at home. Not only the museum of rare and vintage guitars, but a venue which offers concerts in two areas. Need a place to hold an event such as a wedding rehearsal dinner or private party? This is your place. 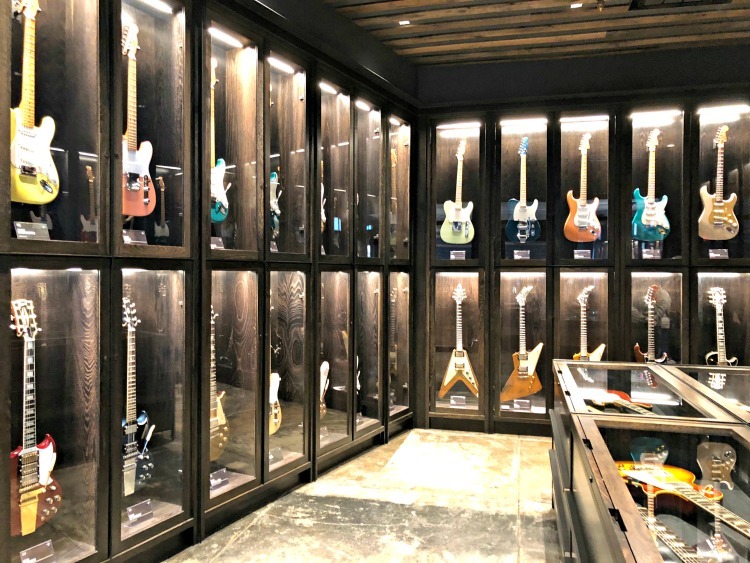 Many of these guitars started as a private collection over twenty years ago, but as it grew and it hit about 1000, the owner knew he would have to share it and the idea of opening a museum started about six years ago, and how glad we are. 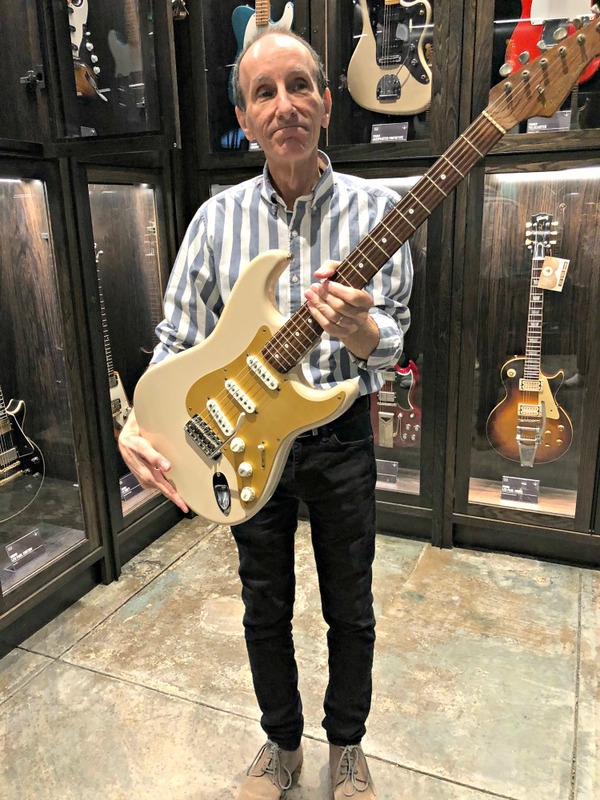 The owner obviously travelled the world in searach of these fine instruments, and it’s pretty unbelievable some of the guitars he was able to locate and purchase. 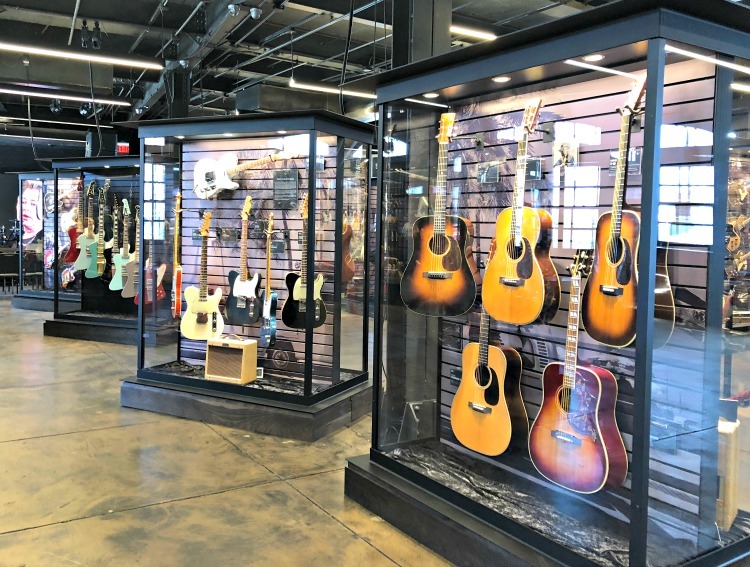 Many music lovers now make a music tour through Tennessee and why not when you think of all the musical history in Chattanooga, Nashville and Memphis. Chattanooga was chosen as home for the museum, being centrally located between Nashville, Atlanta, Knoxville, and Birmingham. No one in the tri-state area has to drive over 3 hours to reach their destination. This is one experience you do not want to miss. Even the non-guitarist will come away with a greater appreciation for the workmanship and hand-crafted work put into these instruments. Taking an all-access tour gets you into the “vault” and is highly recommended. Some may have been played or belonged to some of the biggest names, such as B.B. King, but many have belonged to private collectors and are now all together in this museum. They may not be the actual guitars which likes of Eddie Van Halen or Eric Clapton, owned and played, but when you think of these performers, you can just see them on stage with them. I’ll preface my remarks by saying that all I know about guitars can be summed up pretty quickly: I know what one looks like and they make music when strummed. But just the sheer inventory of the museum and their way of displaying these incredible instruments shows the respect they deserve. The name Fender and Gibson are probably the most familiar to most, and you will see many of these. With the rarity and expense of these instruments, each is encased in its own temperature controlled showcase to keep it free of dust and debris and free from curious hands. Just the beauty of these is art in itself. The first part of the museum and gift shop takes you through a display room going through the decades of instruments. There’s even a stage area set up where you can try out a few guitars. Between all areas of Songbirds, there are approximately 520 guitars on display at this time although there is about 1700 in the collection. The Green Room is your next stop and has special displays which are changed out every four to five months. 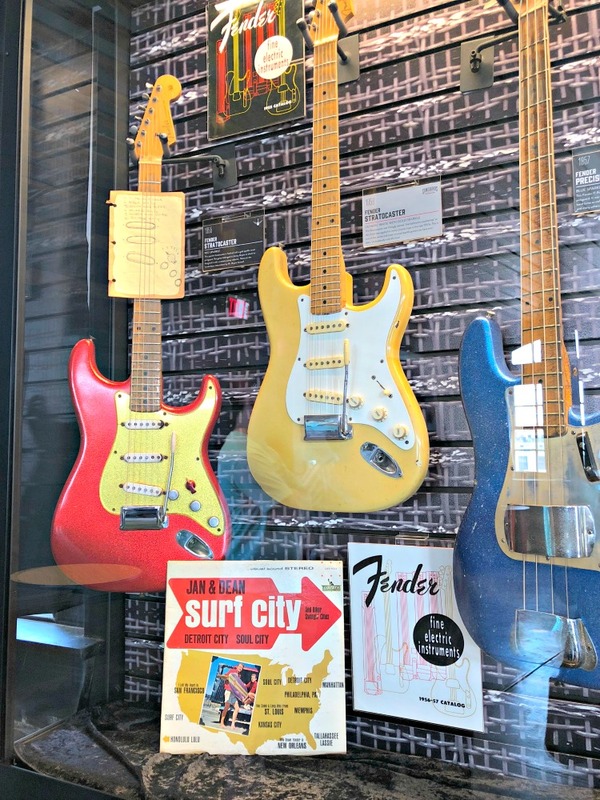 The current exhibit is the Fender Sparkle Guitar and Surf Guitar Collection. When you think surf music, the first group who comes to mind is The Beach Boys, but it actually started several years before as instrumental music. Irv, our tour guide for the day, and manager of Songbirds, was quite knowledgeable about the guitars and a player himself. He encourages asking questions as the main purpose of this museum isn’t the value of the instruments, but educating the visitors on the history. 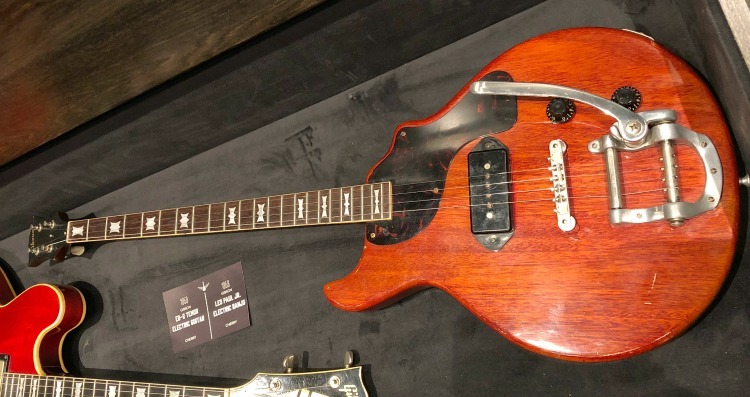 Though many of the guitars you will see at Songbirds dates back to the 1920’s the the main focus is the timeline and the story of the solid body guitar which really starts around 1950. Its the story of men like Leo Fender or Ted McCarty, the president of Gibson at the time, and their initial designs and how they came about them. The musicians who helped influence those designs and how these new instruments would help evolve modern music the way they did as musicians imaginations would use these instruments in ways they weren’t originally designed for. Its a real story of post World War II America and the pride, quality and craftsmanship that went into the design and manufacturing of these great guitars which were all hand made back then. Now into “The Vault”. Here you will find some of the most rare, for many reasons, and most valuable guitars anywhere. As a non-guitar person, I was wowed at craftsmanship of each and learning about the design. 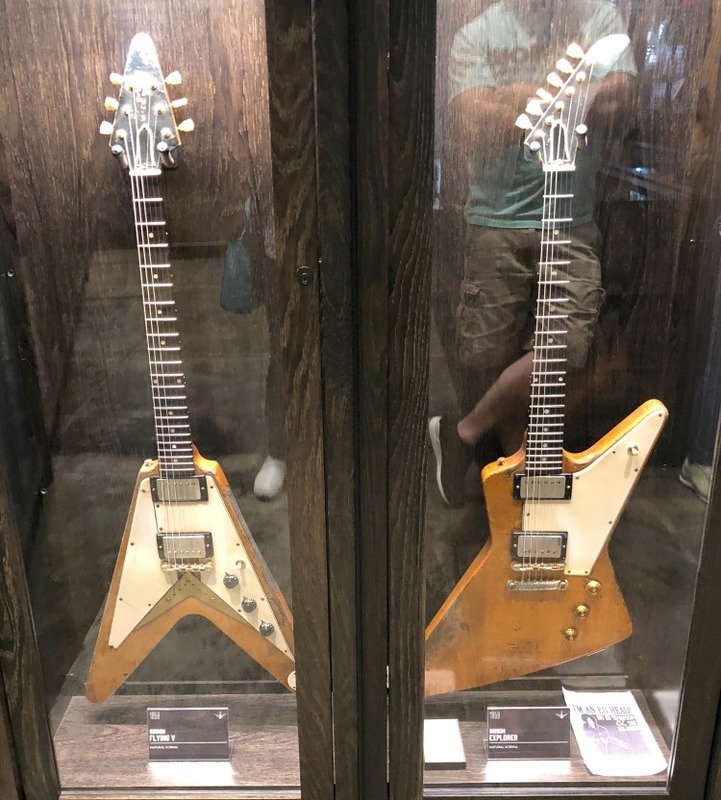 When I saw these “V” guitars, I thought of KISS, but these were actually available in the 1950’s. There’s several prototypes which never made it to production. 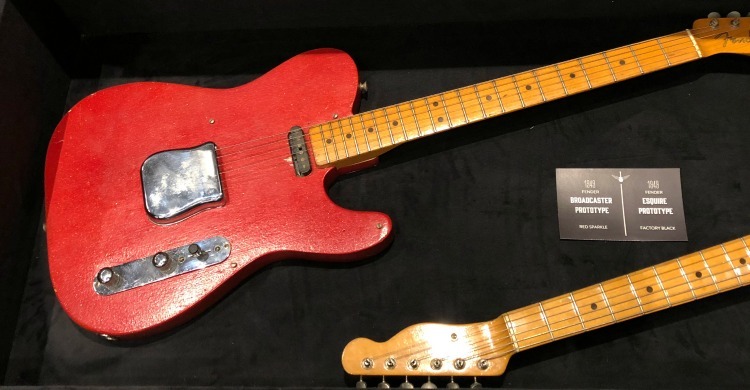 The rarest in the collection is the 1950 & 1951 2-tone sunburst and blonde Fender Esquire. What makes them so rare isn’t the color or make, but they have two pickups, which normally there is only one pickup. There were only 10 produced during that era so it’s tough to put a value on these limited guitars. There are guitars in most every shape and color you can imagine, some very rare. 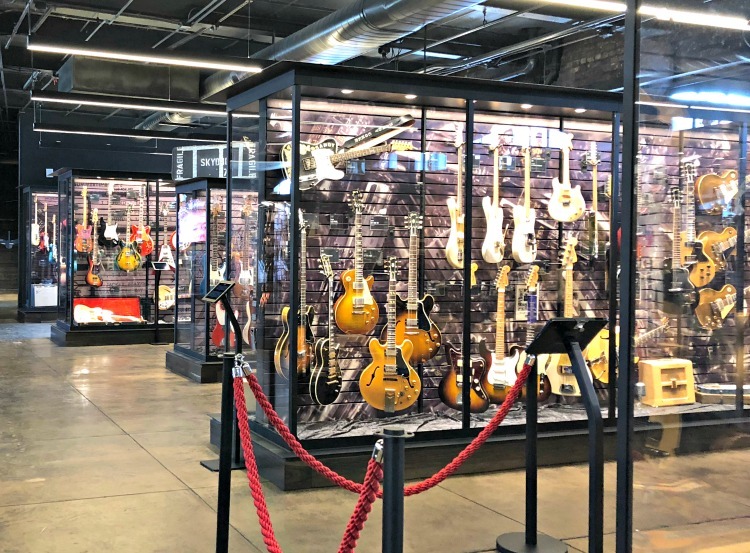 This isn’t just a place for a guitar player to visit, but anyone who loves music, music history or learning how the guitar evolved over the last 100 years. Everybody who takes the All Access Guided tour walks out wowed whether they play guitar or not. Maybe you have a budding guitar player who will even be more willing to take lessons, as they learn more about these fine instruments. Most ask about the value of each or even the whole collection. 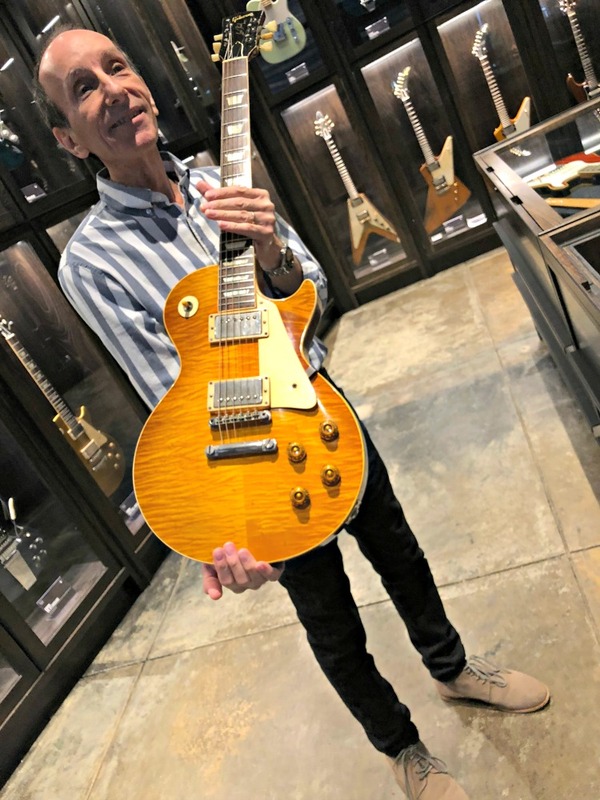 With some being so rare, it’s hard to say but there are numerous guitars worth 6 figures or better which could include a 58 Les Paul Sunburst and a very rare Gibson Explorer. With visitors from all over the world, including Mexico, Japan, South America and Europe enjoying this little piece of history, it makes you appreciate too what we have here in our hometown. You know I’m always looking at design too, so I loved the door handles. The Revelry Room, a small concert area at the Choo Choo was recently added to Songbirds and known as Songbirds South. As another music venue, has shows every week and holds about 500 people with limited seating. The museum itself turns into a great “Listening Room” which we call Songbirds North, on weekends and seats 220 people. Its a real intimate living room environment and a great place to hear some of your favorite artist or discover some new ones. What’s next for Songbirds? They are looking to expand their hours in the downstairs venue so the bar and patio on Station Street will be open during the warm weather months. If you are visiting the Ryman Auditorium in Nashville, a new display will be opening soon which Songbirds have loaned a special guitar to. No details yet on which one, so be on the lookout. Again, I cannot express enough this gem we have in Chattanooga to literally share with the world. You can find all of the concert schedules, hours, and prices online. After your visit to Songbirds, check out a few more of our favorite places in the area – Stir Restaurant and Chattanooga Whiskey. You won’t be disappointed. As rock music lover I would be happy to visit it. Not sure I know much about guitars, but I have friends who do! So… would be cool to go together. I don’t know the “parts” names of all the guitars, but it was an enjoyable tour for anyone. So many are artwork in itself. I’ve never been to a museum like this. I’m naturally a music lover and this seemed to be a great place to amble around for me. I love the fact that there is really a lot of guitar inside the museum. It’s been a while since the last time I play guitar. Thank you so much for sharing this with us. My son can play the guitar some and would have been good if he kept it up. I love the color and design of so many. Whoa…so many versions of guitars! Each time I come across a post like this, it amazes me, that we have so many news things to learn in life. Not knowing that much about guitars, I really enjoyed it. Always fun to learn. I’ve had guitar lessons as a child, but as with most things, I got bored of it and discontinued quite early. Reading this piece brought back those memories. This does look like a fascinating tour.